The human resources (HR) department is responsible for sharing information with all employees related to four themes: my work, my benefits, and my career. The naming of these themes may change overtime, and additional themes maybe added. It must be possible for someone from the HR team to edit the themes. The HR site on the intranet is divided into a top level site with three subsites. Each subsite represents a unique team. The global navigation of the HR site must feature a listing of the relevant themes and link to custom pages that list content for each theme. The site must not display links to subsites or other pages on the HR site. The URL for each employees’ site must be http://emplovees.bluevonder.com/mv/personal/username. Where username represents the login of the employee. The team site for The department must use the URL http://marketina.bluevonder.com. The site for the department must use the URL http://procurement.bluevonder.com. The product team uses the legacy SharePoint 2013 farm. You must upgrade the farm to SharePoint Server 2016 so that the product team can take advantage of all the services that are available to the other departments. The existing products site is very active. You must ensure that users cannot change the site content during the upgrade process. 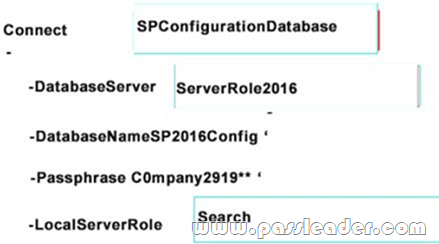 You need to complete the configuration of the Search2016 farm. 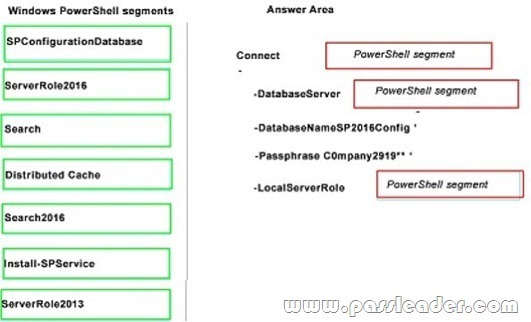 How should you complete the Windows PowerShell command? To answer, drag the appropriate Windows PowerShell segment to the correct location or locations. Each Windows PowerShell segment may be used once, more than once, or not at all. You may need to drag the split bar between panes or scroll to view content. In this section, you will see one or more sets of questions with the same scenario and problem. Each question presents a unique solution to the problem, and you must determine whether the solution meets the stated goals. Any of the solutions might solve the problem. It is also possible that none of the solutions solve the problem. Once you answer a question in this section, you will NOT be able to return to it. As a result these questions will not appear in the review screen. You need to display the values for the Document Status and Department properties. You install a language pack. Does the solution meet the goal? In this section, you will see one or more sets of questions with the same scenario and problem. Each question presents a unique solution to the problem, and you must determine whether the solution meets the stated goals. Any of the solutions might solve the problem. It is also possible that none of the solutions solve the problem. Once you answer a question in this section, you will NOT be able to return to it. As a result, these questions will not appear in the review screen. You need to display the values for the Document Status and Department properties. You create a term set and Managed Metadata column. Does the solution meet the goal? You need to display the values for the Document Status and Department properties. You configure variations on the site. Does the solution meet the goal?